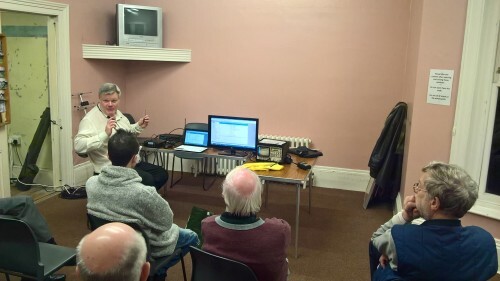 DMR – Digital Radio Explained – By Steve G8PMU – Havering & District Amateur Radio Club. Another brilliant talk by Steve G8PMU, giving the members an insight into DMR. OK Love it Loath it….its here and its probably going to stay. My Personal thoughts….is it a phone, is it a radio….its…both. If DMR promises not to call time on analogue radio equipment and were not going to lose spectrum like analogue television….fine I am for it. I love to build little projects, Frog CW Morse transmitter being the quickest so far that actually transmits/receives. I really doubt analogue radio will go kaput in my lifetime and I really think that the spectrum DMR uses is secure for years and years to come….right……who’s with me on that? hams are getting more spectrum, don’t you know. 70.5 to 71.5mhz, 146 to 147mhz, 60 meter, 472khz and more to come. We are lucky and DMR won’t force the world digital soon, so were clear on that. And back to the talk. Steve started showing us that the Digital spectrum is already quite thick with modes that won’t talk to each other…..its branding, its competition and its who has the bigger antenna all over again, except the modes are having the whole VHS – betamax and HD Video or Blu-ray….errrr….DMR or D-Star or Fusion…there, I said it. Each have qualities but it has already become clear that D-Star is in third place with drop outs, deaf repeaters, overly expensive equipment and a substandard protocol that works when it wants. Fusion coming in next with its quirky microphones that take pictures (and 30 minutes to transmit lo-res images…. that’s so uncool), cheap repeaters and again overly expensive equipment. The clear winner here is DMR… why? I hear you say. The security services use them, the radio is not propriety, there cheap, compatible, repeaters link and distribute seamlessly (roaming is unbelievable), shared bandwidth, brilliant power consumption (better than 50% duty cycle as far as I can tell). the list goes on. As DMR uses TDMA it keeps the bandwidth to just 6.25khz per channel (25khz on FM wideband). So the benefits are clear. 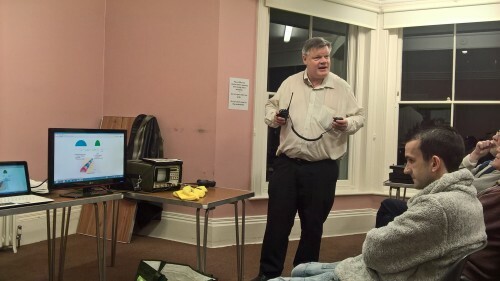 Steve also talks about how roaming gives a nice bridge of repeater function and range responding equipment. You drive around chatting away and the RSSI drops to a level when your radio simply seeks out the next strongest repeater in that talk group and your off again. No need to fumble with switches or knobs while you drive around and no need to lose the contact. When I started out in radio i was unsure why a repeater could only talk locally. OK it was considerably further than simplex at the same power levels but I wanted to see more. I was convinced repeaters could talk to each other by changing the output frequency opening up each other with special DTMF tones and to chat to the next nearest repeater….that way a QSO with Scotland was via say….5 or so repeaters…..I was wrong, but the concept was in my head…for years hoping that one day it would happen. No it never did but today we have a solution, Internet linking repeaters that take our voices turn them into bleeps and send them over the Internet for the other repeater to take the bleeps, turn them back into audio and then back into a good old fashioned QSO.. well kind of. So the basics are explained. Now we have websites to look at the RSSI of the transmission (repeaters only) and the users BER or bit error ratio which is neatly converted to a loss percentage. My job requires me fiddling about with CER,BER,MER and more error ratios on a daily basis and I can tell you its no fun when you either have a signal or nowt when the BER etc drops below a certain threshold. Fortunately for DMR that threshold is pretty low and from observations the BER is actually VBER and the audio drops quality as the error ratio declines before your really out of range all together. Other digital radios will drop out way before DMR it seems and the recovery is equally as poor. Our American cousins across the pond are lucky enough to have DMR 900mhz available and the majority of security services are 900mhz which is great for the second hand radio market, but not so good if there is no ham band to cater for it. In the UK, the frequency of choice and early adopters seem to have hugged and embraced the 70cm band and a good flow of professional and not so professional radios are appearing on the market every day. Sadly 145mhz DMR is not so popular and neither are the radios. Again, at the time of writing, there are no dual band DMR radios that I know of but i feel those clever Chinese will dream up the “Bish Bosh look at my wad” type gizmo’s that will cater for both bands and aimed at amateurs and those who want entry to that band on the cheap, much like Beofengs have captured the top of spurri din makers list. Having a radio do the splits (a bit like Rebel Wilson in the BT Advert) will surely get people rushing out or buying like mad from that well known auction site to get into DMR. Firstly! !, you do have to register to A) get access to some repeaters that Internet link and B) convert your callsign into a number. DMR works by sending your number encoded along with the transmission for the other user to see and then use the code plug that was previously uploaded to the radio to then display your name and the other stations name. Similar to a DNS server, but for radios. Cool I hear you cry. Hhhhmmm if you want to use your friends radio…you get some strange reports and/or ignored totally by people thinking your a pirate? However programming your callsign as a loaner or lender is pretty simple. The code plugs are updated quite frequently and generally only worth updating when a major update is about. Adding user numbers and names manually helps a lot as you don’t lose your mind when looking through the repeater list you memorised (new code plugs tend to jumble things up on every new update, much to the annoyance of this ham and followed by a fist bashing desk session, so keep a backup ofthe old code plug before you overwrite it). So code plug in hand, radio battery full…what next. Well programming a code plug is straight forward, entering the detail manually …not so. Your number is your radios ID, you enter your callsign only as a power on message normally. DMR does not see callsigns unless your text messaging other uses. just be weary that calling someone private over a repeater is as good as encryption and you will get banned from the repeater and possibly need to re-register for a new Radio ID. You have been warned. Most of the code plug is as simple as 1,2,3 but do read the readme files with most of the programming software. Time outs, analogue busy repeater lockout etc will catch out some out. If a repeater is busy it will inhibit your transmit. So the other party has to stop talking and the repeater shut down before you can talk….a pain in the neck if the other party keeps asking “are you still there” and not letting the repeater close down. Not all radio do but some have this function as default and standard. So DMR….. in a nutshell. most of this blog is off the back of Steve G8PMU’s talk and a little further reading with my opinion mixed in. Also keep an eye on TOT rek-ey too. if TOT is set and TOT re-key is too, it will inhibit another PTT in the set period. You time out after 60 seconds and a 30 second re-key is set, your probably going to love that like the proverbial hole in the head. (a good place for an idiom don’t you think). Here are a few useful sites and please comment. many thanks as ever t Steve G8PMU and thanks for those who attended the talk.